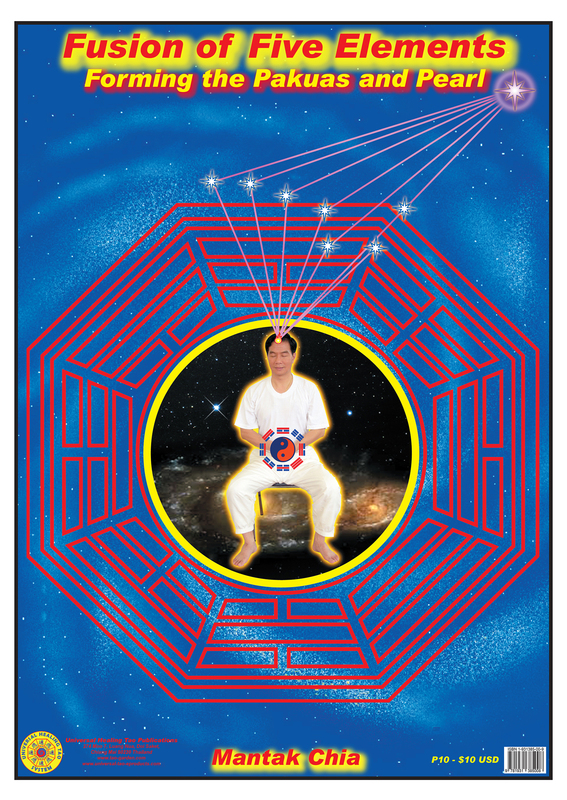 This poster illustrates Master Chia in a Meditation Posture connecting the Crown Point to the Big Dipper and the North Star surrounded by an Eight Sided Geometric Vortex, Pakua around his body and inside his body while activating the Five Elements of the Universe. By using the Fusion I formulas we can build this compost machine with the Six Pakuas (Eight Sided Geometric Vortex-Front & Back, Right and Left, and Top & Bottom) internally; then forming a Pearl (Metallic Energetic Ball) with the excess internal energy (Climate, Sense and Negative Emotional Energy) in the body to open the thirty-two energy channels in and outside the body. Then we can start building an energetic protection field around the body with the Advanced Fusion Formulas (Protective Animals, Energy Body and Planet Forces) and further strengthen this Protection Field with the Chanting of the Eight Forces, Facial Pakua and Heart Chi Kung techniques. Through the Sun and Moon Chi Kung Techniques we can learn to absorb the sun and moon energy directly with the Yang (Positive) and Yin (Negative) Forces of the universe, which opens up the Yang (Governing) and Yin (Functional) Channels of the body.